Nostalgia is a bull that has contributed significantly to the Hereford breed. 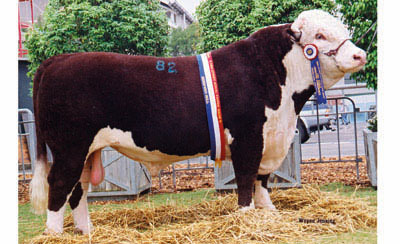 Supreme Hereford Exhibit & member of the winning Hordern Trophy team at the 2004 Sydney Royal Show, Nostalgia sold at auction for $60,000 to the Fraser Family’s Red Hill Hereford Stud. Backing up at Sydney Royal Red Hill H S took out the Sires Progeny Group with progeny of Nostalgia on three occasions. They were awarded the Sires Progeny Group at Melbourne Royal in 2006 & 2007 as well. At their first production sale in 2008 thirteen Nostalgia sons sold to the top price of $40,000 for an average of $9,885. Nostalgia has bred with the quality that his genetics suggested. His progeny, at Mawarra, have consistently reflected his traits, evenness of type & true Hereford cosmetics. His first daughter, Last Day 225, sold at 12 mths to Princeton H S for $5,500 at auction. His 31 sons have sold to $35,000, recording an average of $7,960. $35,000 M. Rawhide was purchased by Glendan Park H S at the Hereford National in 2006. M. Terminator was sold for $30,000 at the Hereford National in 2008 after being awarded Junior Champion. Two sons have been retained as sires; Rip Snorta and Standout. His legacy continues through the twenty one daughters we currently have in herd, many grand daughters and two ET sons offered in 2012 as $16,000 Lot 3 M. You Too and $14,000 Lot 115 M. Yardstick who was in our Hereford National Team and sold to Bowmont H S.